Misleading DNA Evidence: A Guide for Scientists, Judges, and Lawyers presents the reasons miscarriages of justice can occur when dealing with DNA, what the role of the forensic scientist is throughout the process, and how judges and lawyers can educate themselves about all of the possibilities to consider when dealing with cases that involve DNA evidence. DNA has become the gold standard by which a person can be placed at the scene of a crime, and the past decade has seen great advances in this powerful crime solving tool. But the statistics that analysts can attach to DNA evidence often vary, and in some cases the statistical weight assigned to that match, can vary enormously. The numbers provided to juries often overstate the evidence, and can result in a wrongful conviction. In addition to statistics, the way the evidence is collected, stored and analyzed can also result in a wrongful conviction due to contamination. This book reviews high-profile and somewhat contentious cases to illustrate these points, including the death of Meredith Kercher. It examines crucial topics such as characterization of errors and determination of error rates, reporting DNA profiles and the source and sub-source levels, and the essentials of statement writing. It is a concise, readable resource that will help not only scientists, but legal professionals with limited scientific backgrounds, to understand the intricacies of DNA use in the justice system. 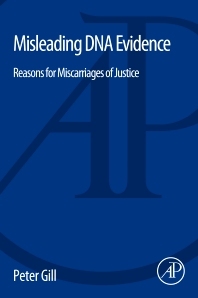 1.4 Why Do Miscarriages of Justice Occur? 3.2 When and How Did the “Foreign” DNA Transfer to Underneath the Victim’s Fingernails? 3.4 Will a DNA Profile That is Transferred by Either “Passive” or Physical Means (Scratching) Persist for 7 Days? 4.10 How Does a Search of a NDNAD Affect the Strength of Evidence? 4.14 How Does the Weighting Alter P(G|Eo) If the Suspect Is Taken from Outside the Target Population? 4.18 Is There a Scientific Basis to Define “Weights” Using “Geographic Profiling”? 4.21 How Far Have the Courts Adopted This Thinking? 4.30 Can Expert Opinion Replace Peer Review? 5.10 How Robust is the Answer? 5.13 How Was the Evidence Interpreted by the Judges? I joined the Forensic Science Service (FSS) in 1982. I began research into DNA in 1985, collaborating with Sir Alec Jeffreys of Leicester University. In the same year we published the first demonstration of the forensic application of DNA profiling. In 1987 I was given an award under the civil service inventor’s scheme for my discovery of the preferential sperm DNA extraction technique and the development of associated forensic tests. I was employed as Principal Research Scientist at the Forensic Science Service (FSS). This was the highest scientific grade within the FSS. I am professor of Forensic Genetics and I hold concurrent positions at the Norwegian Institute of Public Health and the University of Oslo. In 1993-4 I was responsible for leading the team which confirmed the identity of the remains of the Romanov family, murdered in 1918, and also the subsequent investigation which disproved the claim of Anna Anderson to be the Duchess Anastasia (using tissue preserved in a paraffin wax block for several decades). This was the first example in the world of the solving of an historical mystery that involved the analysis of very degraded and aged material, and was one of the first demonstrations of low-template DNA analysis. In relation to the above, I was responsible for developing a ‘super-sensitive’ method of DNA profiling that is capable of analysing DNA profiles from a handful of cells. This method was originally known as low-copy-number (LCN) DNA profiling. Now it is known as Low template DNA profiling. New statistical methods and thinking were also developed to facilitate the new methods. I am currently completing a book (deadline of 31st March, 2014) to be published by Elsevier that describes methods to report ‘trace-DNA’ along with the various pitfalls that are illustrated by recent miscarriages of justice. I was responsible for leading the team that developed the first multiplex DNA systems to be used in a National DNA database anywhere in the world, and for the design of the interpretation methods that are in current use (c.1995). I have been involved with giving evidence in several high profile (controversial) cases – including the Doheny / Adams appeals, and the Omagh bombing trial in the UK. Currently I am a member of the European Network of Forensic Science Institutes and chair of the ‘methods, analysis and interpretation sub-section’. I chair the national UK DNA technical working group. I am chair of the International society of forensic genetics DNA commission on mixtures and I have written a number of ISFG recommendations on low-template and mixture interpretation that are highly cited. I am a member of the European DNA Profiling Group (EDNAP). I have published more than 180 papers in the international scientific literature – many of these are collaborative papers under the auspices of ISFG, EDNAP and ENFSI. "Professor Peter Gill’s book, Misleading DNA evidence: Reasons for Miscarriages of Justice has international significance and could not be more timely. In the United States and across the much of the globe, there is a lingering perception that the thousands of miscarriages of justice that reach the media are usually relics from a bygone era where the forensic tools were rudimentary. It is widely assumed that the new PCR-based DNA testing systems in use today dramatically reduce or eliminate the chances of wrongful convictions. Dr. Gill explodes this myth with keen, compelling and original insights. He focuses his analysis on deeply disturbing issues that he reveals at nexus between science and the criminal justice system. This book is a must read for prosecutors, defense attorneys, academics and anyone interested in ensuring that justice is done. Indeed, it will benefit anyone who is concerned that the aura of infallibility commonly associated with DNA and associated statistics can (and has) impaired criminal investigations and related proceedings. Dr. Gill correctly warns us that the DNA aura carries with it the potential to blind, distort or mislead the way fact finders perceive information. None of us should be indifferent to the risk of misleading the finders of fact, whose search for the truth is the cornerstone of justice." --Stephen Patrick Hogan, M.A. J.D.